Two articles in the British media about the recent wave of Arab terror include background information on the Temple Mount, the contested Jerusalem site both reports claim represents one of the root causes of recent tensions. Unfortunately, both reports omit crucial information about the Temple Mount, known to Muslims as the al-Aqsa Mosque Compound. Six Israelis and 27 Palestinians, including nine alleged attackers and eight children, have died in almost two weeks of street attacks and security crackdowns, as Israel and the Palestinian territories suffer their worst period of unrest in years. The attacks began on October 3, stirred in part by Muslim anger over increasing Jewish visits to the al-Aqsa mosque compound in Jerusalem’s old city. The violence has been stirred in part by Muslim anger over increasing Jewish visits to the al-Aqsa mosque compound in Jerusalem, Islam’s holiest site outside the Arabian Peninsula. Both reports omit the fact that Jews are of course visiting the Temple Mount (located within the greater “al-Aqsa mosque compound”), the holiest site in Judaism. Readers would likely be left with false impression that Jews are trespassing on a uniquely Muslim holy site – thus causing increased ‘tensions’. 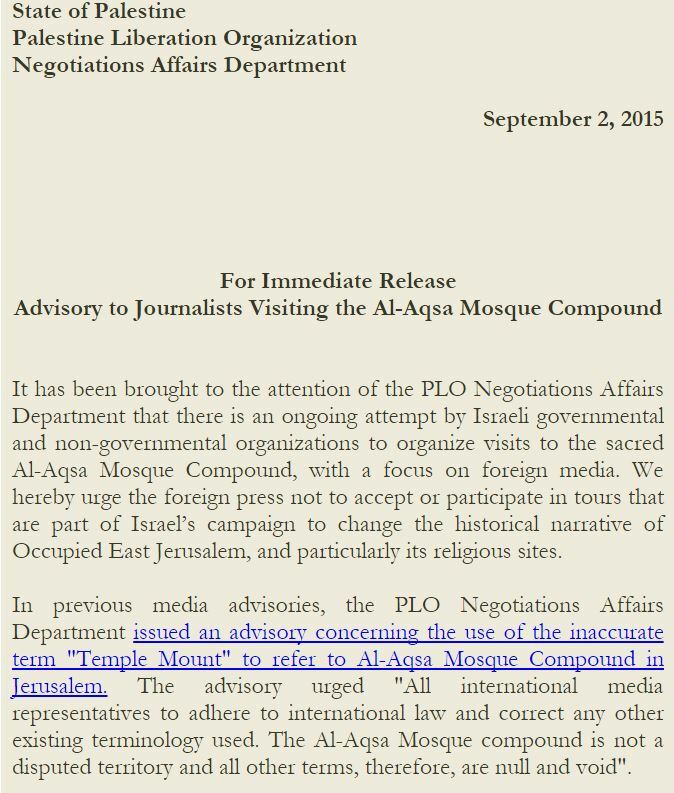 Indeed, we’ve noticed a greater tendency of UK news sites to highlight the Muslim importance of the site, while downplaying its significance to Jews, following a PLO memo to journalists “advising” them not to use the term “Temple Mount”. 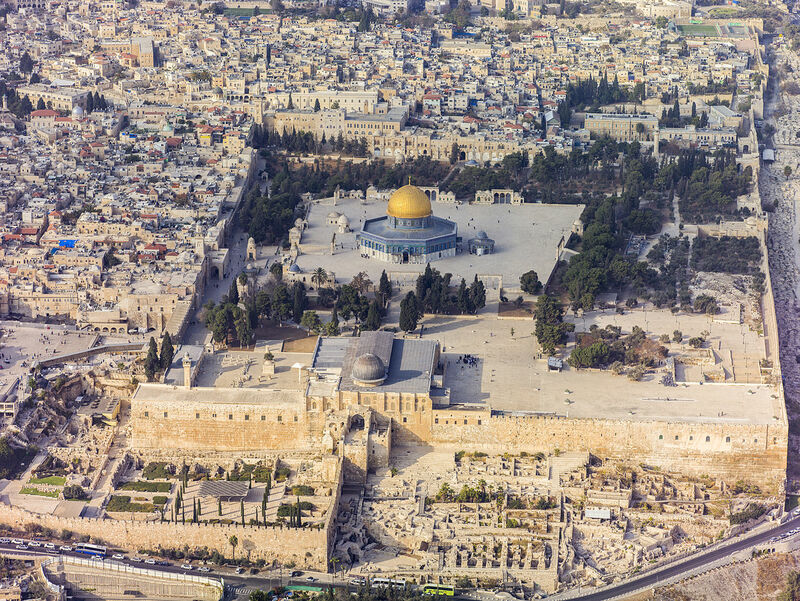 Instead, they instructed reporters to refer to the site as the “Al-Aqsa Mosque Compound”, and even strangely argued that using the term “Temple Mount” is a violation of international law. We of course don’t know if there’s a connection between the PLO memo and the tendency of journalists covering the region to emphasize the Islamic significance the holy site. Nonetheless, it’s troubling that, for whatever reason, both reports fail to accurately convey to readers the Jewish significance of the Temple Mount, thus reinforcing the continuing Palestinian denial of Jews’ connection to the holy city. Jew hatred is the cause of the violence, but this is just too simple for the media to accept so they have to make up as many reasons as they can to obfuscate this very crude but true reason. Yes, but the media themselves are both driven by Jew-hatred and are promoting it (see Indigo’s post below). The attackers are alleged. And the Muslim frame to reference the Holy Land is legit? These are the same Western journos who quoted death counts from Hamas and then later admitted there may have been some discrepancies, yes? In the same vain the Guardian has called the Jews visiting the temple mount as “religious zealots”, and “fundamentalists”, while people who murder because of this were labeled “frustrated youths”. I.E people who peacefully visit their holy site are zealots, people who murder for religious reasons are just frustrated. CNN today portrayed this current battle as Palestinians Protesters going up against the IDF. Palestinains are protesting what, CNN? That Jews live in the Middle East? That Jews defiled Islam’s 3rd Holiest Site while visiting Judaism’s Top Holy site? That Israel exists at all? Why, CNN, you guys are trustworthy….. And so smart, too! Islam’s third holiest site? The one that nobody used to go that was in disrepair and covered in weeds until the IDF showed up.